Perfect way to celebrate the American Independence Day! The day however started on a completely different note. Sam went to work. Yes! Even on 4th of July. He is a Finance guy and its quarter close! Lil Sid came back from school on Wednesday with sore throat, sniffles and slightly warm. Thursday morning greeted me with thunderstorm and a flash flood warning. You get the picture.... Right??? Most of the day was spent sulking, eating leftovers and tending a cranky kid. Around 6ish, my neighbor had fired his grill and my apartment was filled with the smell of charred meat. We were all salivating. I had this sudden urge to hog on some real juicy burgers. Just then a friend called to know our dinner plans. "Call them over...call them over", I shouted from the kitchen as I defrosted my ground meat in sink-full of warm water. I also sauteed some onions, green bell pepper, mushroom with garlic in olive oil to go on top of our burger patties. I made both Chicken and Beef burgers, but with the same spices. I had used 1 pound of ground Beef Sirloin and 1 pound of ground Chicken Breasts. Since both the meats were very lean, I added some moisture with yogurt and bread soaked in milk (a Rachael Ray tip). I had some leftover meat mix and the next day I used that to make three different lunches for us. My Lunch: Burger Bowl - Beef Burger Patty and tomatoes on a bed of baby Arugula. Dressed up with little Extra Virgin Olive Oil and salt and pepper. 1. In flat dish add a little milk and soak a slice of bread. 2. In a big bowl, combine the ground chicken or beef, onion, garlic, green chilies, Worcestershire Sauce, yogurt, salt and pepper and mix well. 3. In a separate bowl, lightly beat and egg and add it to the meat mixture and mix. 4. Squeeze the milk out of the bread slice and add the bread slice to the meat mixture and mix well. 5. Heat a nonstick pan over medium high heat. Spray with nonstick spray. 6. Take a tiny amount of meat mix and make a tester patty. Fry it on the pan for 1 minute per side. Taste it and check for seasoning. Adjust seasoning accordingly in the meat mixture. 7. Make 2" thick patties out of the meat mixture. It should yield 8-10 patties. 8. Fry in the pan for 3-4 minutes per side. 1. Heat the olive oil on medium heat. It should be warm and not hot. 2. Add the minced garlic and let it fry for sometime. 3. Add the onion, mushroom and green bell pepper and saute till cooked yet crunchy. 1. Toast the burger bun lightly in a toaster. If you don't prefer it, skip it. 2. In a bowl, combine Greek yogurt with the mustard. You may use light Mayonnaise too. 3. Spread the mustard-mayo spread on the bun slices. 4. 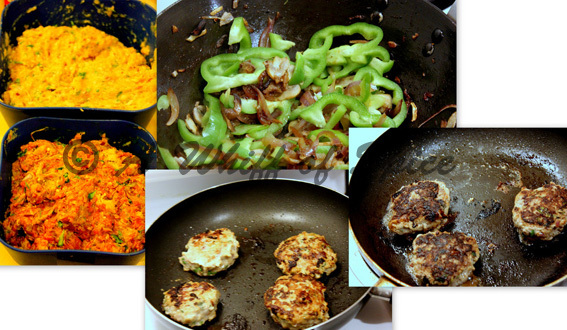 Place the chicken/beef patty on it and top with the sauteed veggies. Our 4th of July started off on a dull note but ended on a real good one. Sadly all the fireworks shows were either postponed or cancelled due to the weather. But over all a real good holiday with good food and great friends. Hope you'll had a good one too. Awesome looking burgers. So vibrant to look at.